You know all the things you've gotta do in LA before you die, but what about all the things you've gotta eat before heading to the big traffic jam in the sky? 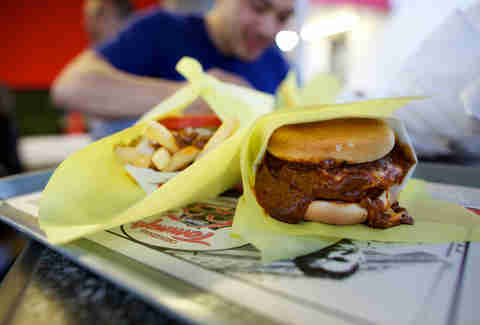 Here's our list of 50, from Apple Pan's hickory burger to an ice cream sandwich at Diddy Riese. 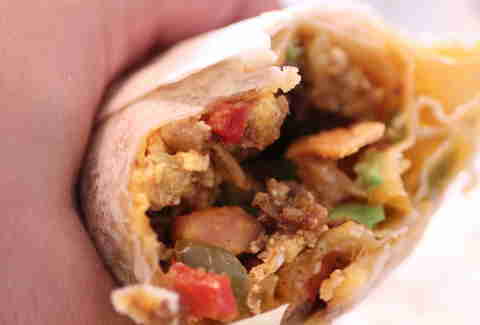 It may only be less than a year old, but this small coffee shop's chips-and-smoked-potato-laden breakfast burrito has become a defining member of the city's hand-held tortilla-wrapped community. 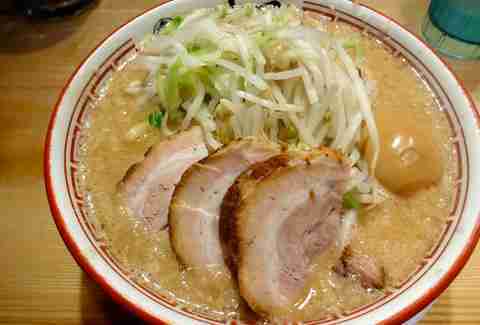 By far the most well-known Japanese noodle-and-broth combo in the city, and even with the city's ramen explosion, it's still one of the most delicious. Yeah, it's got the word "salad" in the name, but you can get this unctuous dish with an egg and sausage. Which you will. And you will be very happy you did. Available only at the bar at this raw-fish institution, the Seared Salmon Right Away melts on your tongue and makes you truly wonder why you've ever eaten second-rate sushi before. This hole-in-the-wall Pasadena farm-to-table restaurant has rapidly become one of the city's go-to tables, and this dish -- with lobster, fennel, and truffle butter -- is its shining-est star. It's worth exploring Long Beach to end up at this classy steakhouse, which grows and butchers its own meat, serving up limited servings of each cut that'll clean out your wallet in the most delicious way possible. These slider-sized morsels have become the signature dish at Jon & Vinny's signature restaurant -- the rest of the menu changes around them, but a meal there without these fatty blasts would be sacrilege. LA's got access to the best fresh produce in the country, and at no time is that more obvious than on a hot summer day when you come across these street vendors, usually in front of a bank: get a $5 mixed bag of ultra-fresh fruit (and jicama, which always seems random) with a squeeze of limon (and if you're into the spicy stuff, some chili powder), and dig in, thankful that we've got juicy, flavorful fruit for a snack and NY's got... pretzels? It's simply called an "Omelette," but this perfectly buttered, Boursin cheese-stuffed fluffy egg dish is much more than that: it's Ludo Lefebvre's way of saying "I'm not just a TV-star gimmick." And after one bite, you'll agree. This dinosaur-sized bone-in hunka-hunka-delicious meat isn't just one of the best BBQ dishes in the city, it's one of the best dishes in the city, period. 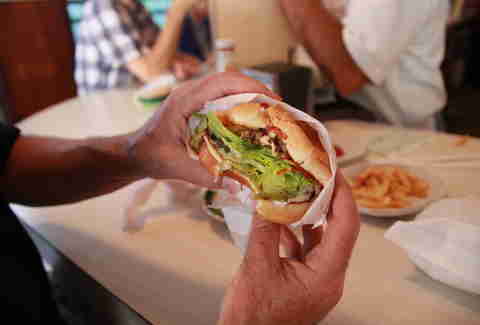 Thankfully, nothing at this WLA burger institution has changed since 1947: the space-wasting counter-only set-up, the old-school servers, and this burger -- legendary for its smoky, classic flavor. You may have a hard time finding this woman, but you NEED TO FIND THIS WOMAN, who hand-makes blue-corn tortillas stuffed with chicharrones, cheese, and some sort of magic insanity that makes you go "where the hell have you been my whole life???" 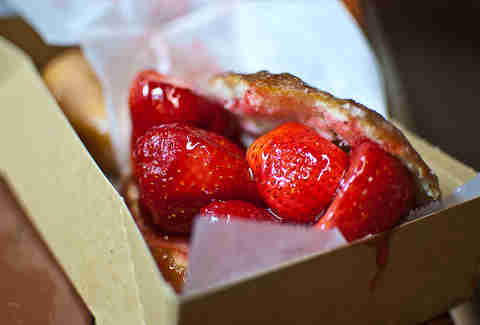 "But, it's like a pie filling made from fresh strawberries stuffed inside a donut," say haters. To which you'll say, "DUDE IT'S LIKE A PIE FILLING MADE FROM FRESH STRAWBERRIES STUFFED INSIDE A DONUT!!!!" 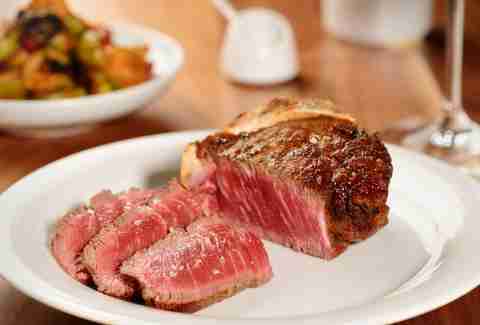 Is this the best steak in the city? It is not. Is this the best steak in the city at 3am inside a relic from the 1950s where you're treated like Frank Sinatra in his prime? Yes. It is most certainly that. 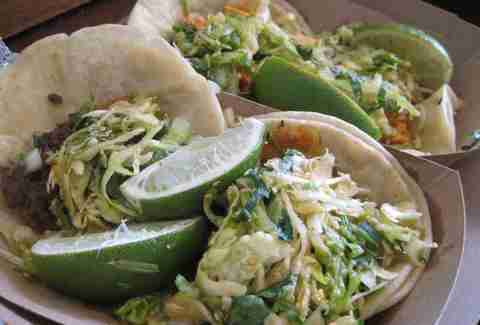 One bite of the shrimp taco and you'll understand why this truck is one of the most lauded cheap bites in the city. The dirty secret of Roy Choi's excellent Korean menu is that the best stuff is actually NOT in the pots -- rather it's side dishes like this gooey, savory, creamy uni-and-rice dish. Anyone who's lived in The Valley is either a Pita Kitchen disciple or has wondered what the hell the out-the-door lines on Van Nuys Blvd are all about. Well, here's the thing: they're about these spiced chicken patties, this mushy, flavorful eggplant, and this perfectly oily hummus. Two pro tips, though: pay the extra $1 for a third side (baba ghanouj!) 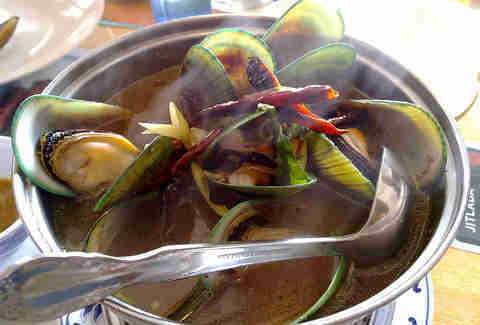 instead of stomach-filling rice, and avoid, at all costs, the same-named ripoff restaurant on Wilshire. There are a lot of things you don't know about this beloved Middle Eastern chain, but here's one thing you do: its chicken (and ohGodthat garlic sauce) are absurd. Another half-chicken? Yep. But Dino's -- a series of roadside cafes that look about as nondescript as possible -- couldn't be more different than Zankou; its deep-red Mexi-ish bird is covered in a vinegar sauce that makes it truly moist all the way through. Pro tip: order extra sauce and let it seep into the fries or rice below for an insane carb-bomb side. 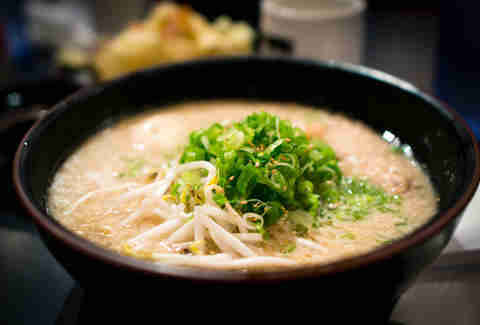 Why not get the frothy, thick tonkotsu ramen? Because the dippable tsukemen gives you the ability to have as much -- or as little -- broth on your noodles as you want, plus the inevitable leftovers travel better. The Chinese chicken salad is one of LA's defining dishes, and the version at the gentrified Chinese chain Chin Chin is one of its defining variations, thanks to a gingery dressing, an abundance of nuts, and -- oh yeah -- not one, but TWO types of crispy fried noodles. Its BBQ meats may be divisive, but no one who's been to this new-ish meat-centric spot can deny the buttery, gooey hoecake, which is essentially a cornbread if cornbread were made of dreams instead of corn. 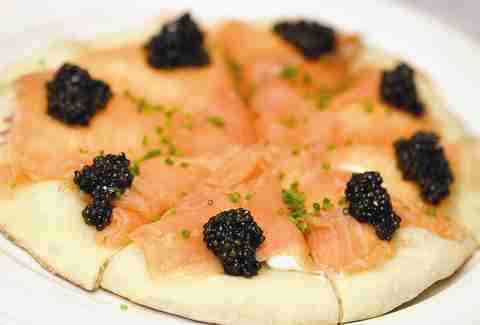 Its glory-est days may be behind it, but Wolfgang Puck's flagship restaurant is still an emblem of Hollywood decadence, and this now off-menu signature dish was once the height of LA's food scene -- and one bite in, you'll understand why. As notable for the fact that you'll get yelled at as you try to order it as it is for the monster amounts of crazy-good bacon that the guy yelling at you will eventually stuff into it. Mmmm. 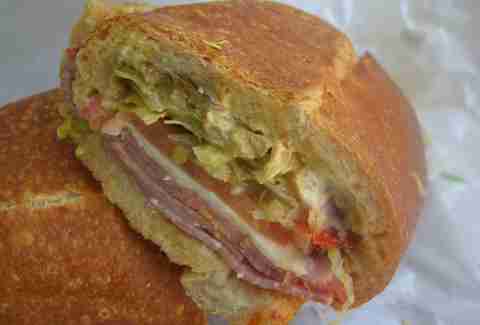 This is pretty universally considered one-of-if-not-the best sandwich in all of the LA area. If you haven't had this meat monster yet, what have you been waiting for? Really, WHAT? There are so many things we could recommend at the Grand Central Market, but this platter of freshly smoked fish hits the soul in the same way as Eggslut -- without the line. 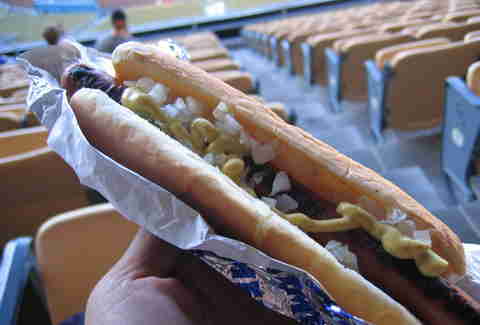 Everyone knows that Dodger Dogs are not the best hot dogs in the city -- and everyone also knows a Dodger game is incomplete without one. The pro-tip, as always, is to get yours grilled -- they're only available from a few vendors that way, but they're so much tastier than the steamed ones you can get throughout the stadium. 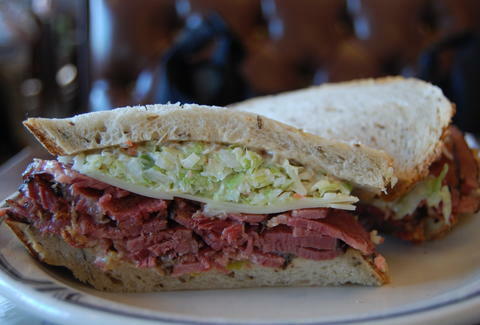 Is Cole's or Phillipe's the best French dip in the city? That's a debate we don't want to take a side in. It's a rite of passage to stand in line for an hour at this nearby-to-UCLA spot, asking the entire time you're in line if it's really worth all that standing around for a $2 ice cream sandwich. And then you take a bite, and, yep, it totally is. What, you've only ordered the set sushi meals? 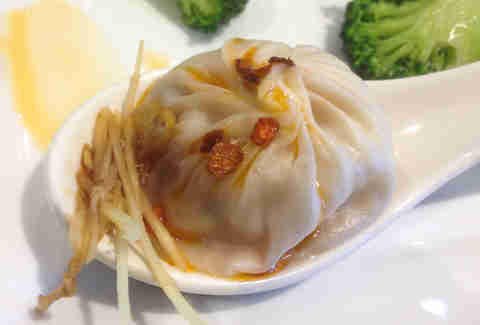 Then you've missed out on the real treat: this absurdly flavorful bite, which has to be ordered separately. It's worth it. Completely. Love it or hate it, Sang Yoon's defining dish set the stage for LA's reputation as a burger mecca, and still stands as one of the best ground meatwiches in the city. It's worth the drive to this strip mall for two things: the skewers of meat at Kushiyu, and this Mediterranean restaurant's salads, which come with any entree order and fill the table with everything from eggplant to chopped liver, all dippable with their piping-hot homemade bread, which is sort of a mix between lavash and pita. It's outstanding. The truck that started the nationwide food-truck trend still serves their signature dish, which melds Korean shortrib with mexican flavors for a perfect blast of conflicting, complementary bites. You can still chase their trucks down, or you can get the dish at their new-ish taqueria in Palms, where they're also doing magic like carnitas-and-kimchi-loaded fries. Your call. The family that once ran Mariscos Chente and brought this dish to LA from Sinaloa has split in two, with the original chef at Inglewood's Coni Seafood and other members of his team keeping the tradition going at the original West LA location. No matter which one you end up at, you're going to want the whole snook -- a massive (bring friends), splayed-open, perfectly roasted fish, served with stewed onions, lime and homemade tortillas for build-your-own-fish-tacos that are singularly delicious. When they opened Son of a Gun, Jon Shook and Vinny Dotolo wanted to recreate the flavors they remembered from fish shacks in Florida, and they knocked it out of the park with this fish dip, going so far as to import the crackers they use to give it a hit of salty authenticity. Pro tip: even if you don't love Tabasco, it adds a killer vinegar extra to the already-great flavors. So many spots in the city offer platters of cured meats, but Bestia's is all made in-house, which means the process is carefully curated, and the meats are that much better for it. Some people may complain that the pizza here is too floppy, and yeah, it kinda is. But the ingredients in its BBQ chicken variation are top-notch, and the serving size is massive, and once it's in your mouth, who cares about that flop anyways? 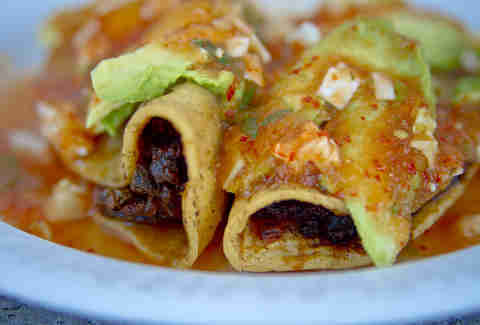 This sort of formerly under-the-radar Oaxacan spot just won a James Beard Award for having killer mole. Seriously, if that doesn't get you in the door, what does? 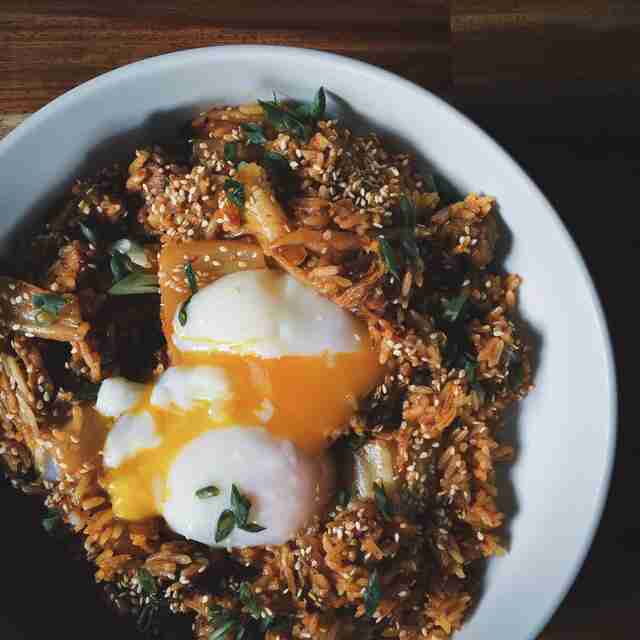 Walter Manske's gorgeous restaurant has gotten praise for its dinners, but the real move is to go for brunch: the pastries are insane, and you can order this monstrous bowl of egg-topped, short rib-laden spicy rice and then... nap. You're definitely gonna nap. Going to C&O for a big-group dinner is unavoidable, and surely someone will complain in the comments below that the massive pasta plates are not up to snuff with other Italian joints in the city. Who cares? The free garlic knots -- which come both with every dinner and for whomever is waiting outside for a table as well -- are, like, insanely, insanely great. That said, if you do want Italian, and you don't mind dropping some dough, classic Italian steakhouse Dan Tana's still satisfies, especially when you're ordering something as classic as meat-stuffed lasagna. 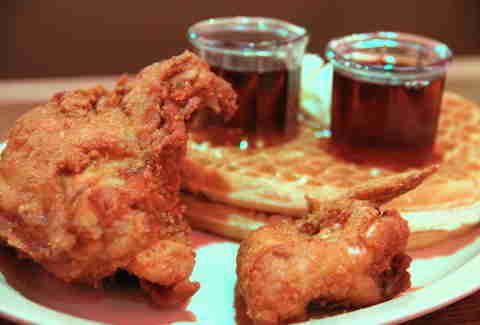 It's the #1 fried chicken in the city according to the most expert of experts. Do you really need another reason? Because if you're gonna have your last meal, it may as well be bacon-wrapped and topped with onions, jalapeños, and mayo. Right? Jeff Miller's glad he's not dead yet, because he's ready for 50 more. Watch him hit 'em at @jeffmillerla on Instagram and @ThrillistLA on Twitter.